and sorting buttons. 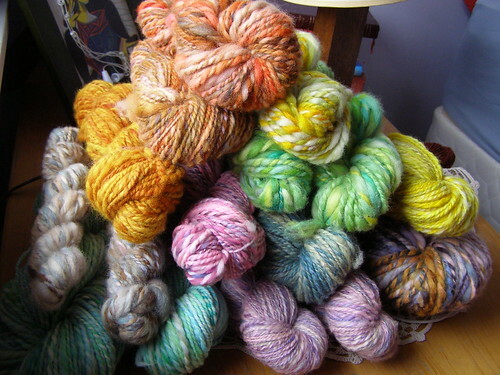 and trying to get the business organized for the new year (oh the yarn! oh the wool!). and finishing up some gifty knits… i have three projects that i want to get done by the end of the month. and i’m nearing ready to send the christmas package home! Oh, oh, oh….I love the one right at the top!! Yum! I love the orange one on top. Came across your site.It was amazing. Sorry i didn’t get a chance to get back to you on my design cap I ordered. I liked your new red buttons. Looks great. I hope you would like to bring knitting and non functional button style together. Good way to go. Gotta love a pyramid of yarn. I especially like the two purple skeins hiding at the bottom. I am in love with the one on top…it’s yelling to me!